I have vitiligo. It runs in the family. My dad has it, his dad had it. As a result, along with the Prance family dashing good looks (what? ), I inevitably got it. It’s a part of my personal DNA and is something that people first notice about me. It’s around this time of year that it inevitably becomes more noticeable – as my skin gets darker, the white gets whiter. So while I have always loved summer, I have always spent it a) getting spray tanned so you can’t see the white parts, and b) arming myself with a barrier up against all the inevitable stares/glances/well-meaning questions. Of course when I was younger it was bad, so, so bad. A tall, painfully thin teenager does not want to be any more conspicuous than she already is. As we know, the beauty industry can often take a lot of heat. The models are too skinny – bad role models – the models are too pale, too dark, too this, too that. But in my humble opinion, the beauty and fashion industry is rocking it of late. Photographer Peter DeVito recently released a series of photographs of models with vitiligo, albinism, freckles and birth marks, telling Teen Vogue he created the artwork to “empower more people and to help normalize skin conditions”. And while Teen Vogue slightly contradicted his message, writing, ‘beauty is more than skin deep’, a statement surely suggesting that those with skin conditions are not beautiful on the outside too, DeVito’s thought was there. 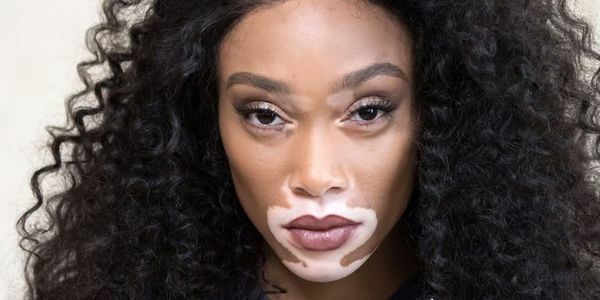 Missguided has recently launched its #inyourownskin campaign featuring six models with different skin types, while CoverGirl used a model with vitiligo for the first time. And while we might not all the way there, yet, we’re taking it one step at a time. Yes there may be also be some suggestions that hiring models with different skin conditions/disabilities should be common place, and not a commodity to capitalize on. However, I truly believe this will be the case ten years down the line. There won’t be news stories about these models, or photographers creating projects about skin condition, as it will be the norm for these models to be booked alongside those models without the differences.